Support, with Harvesting and Utilization inputs, to the proposal/justification for a new Working Party on Socio-economic Issues of Poplar and Willow Development (sustainable land-use and livelihoods, climate change mitigation and adaptation and bioenergy/biofuel). During the 22nd of the IPC, the Working Party held one technical meeting during which three scientific/technical papers were presented and several harvesting and utilization posters displayed at the poster sessions. The mandate of the Working Party was to facilitate the exchange of scientific and technical information about the harvesting and utilization of Poplars and Willows, particularly through collaborative research programmes. During the period 2000-2004, the Working Party prepared information for the Harvesting and Utilization portal on the IPC website. At the business meeting, it was agreed to change the name of the Working Party from "Logging and Utilization of Poplar and Willow Wood" to "Harvesting and Utilization of Poplar and Willow Wood". Sound expertise/experience of Working Party members. Communications with the Working Party not keeping in pace with rapid changes in technology and markets. 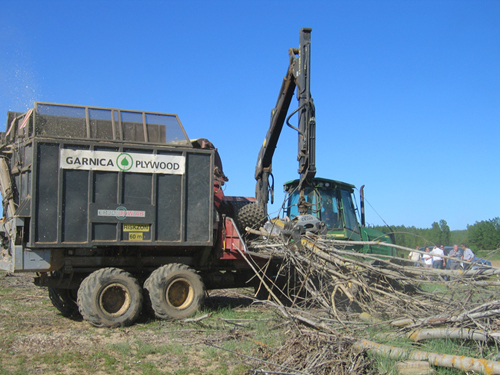 New innovative opportunities for harvesting and utilization of short rotation Poplars and Willows for a range of end uses and services. Lack of strong linkages between production related factors and utilization and markets. Disseminate new scientific and technical information through periodic meetings and posting publications from member countries on the IPC website. Issues related to forests products and processes. Strengthen the integration of production, harvesting and utilization systems by improving the communications between the producers and users of forest products and byproducts. This is the oldest working party of IPC, whose establishment dates from the early 1950s. 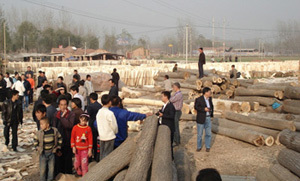 It brings together all experts interested in the question of logging and utilization of poplar and willow wood. The working party has drawn up a standard form for technical trials which is intended to describe and qualify the wood of the cultivars used by member countries. The working party has also dealt with felling and harvesting practices and with developing new possibilities for wood utilization. Economic data have periodically been gathered and submitted to IPC sessions, thus making it possible to monitor the evolution of volumes utilized, operating costs and prices. 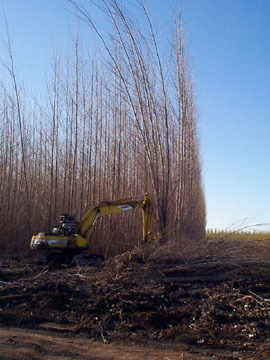 Harvesting of poplar (Photo: Washington State University)The working party has indicated that the trend in harvesting is now to use all-tree harvesters in plantations, and specially constructed machinery for short rotation biomass plantations. This has confirmed that the outputs of research are filtering down to the operator. Trends in wood products have been influenced by the need to reduce waste. Traditional uses have remained important but high value products will likely to be more actively marketed in the future and research will, therefore, be important in the coming decade. A summary of recent developments and trends in the utilization of poplar wood is Achievements in the utilization of poplar wood-guideposts for the future by J. Balatinecz, A. Leclerq and D.E. Kretschmann. With regard to the aims of poplar breeding, it has been the opinion of some in this working party that breeders should aim at producing trees with high density and straight form, apart from resistance to pests and diseases. Others maintain that breeders should endeavour to produce trees that would satisfy a variety of industrial requirements. 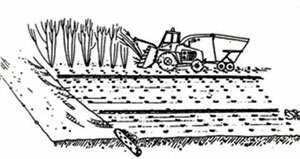 Recent working party discussions have included the effect of management regimes, large-scale industrial projects, and the benefits of combinations with agricultural crops or grazing - although this topic is now included in the responsibilities of the Working Party on Production Systems and Environmental Applications for Poplars and Willows. In this context, the role of poplar growing on "set aside" farmland in the European Economic Community (EEC) has been discussed, together with the uses of computer modelling in such situations - see for example "Using bio-economic modelling for the design and evaluation of characteristic agroforestry systems" by T.H.Thomas and R.W. Willis, presented at a meeting of the working party in 1996 (reference FO:CIP:BS/96/10). Member countries have been invited to pay more attention to the environmental aspects of poplar and willow growing, as well as to the recycling of products. The need for greater coordination between the growers and those who use the wood of poplar and willow has been stressed. The working party recommended from an early stage that joint sessions should be held between the different working parties of IPC, in order to achieve greater coordination of research and development and the transfer of technology. It has proposed that mechanisms should be developed for the greater involvement of the private sector in its future activities, and has recommended that the Executive Committee should investigate ways of promoting student exchanges and participation in meetings of the working parties. The working party also identified the subject matter for three technical leaflets to be prepared by its members and passed to the secretariat: economics and the modelling of poplar production; production, technical characteristics and the utilization of willows; and production, technical characteristics and the utilization of poplars. the development of flexible, high-value conversion technologies. During the 22nd session of the IPC, the Working Party held four technical meetings during which 13 scientific/technical papers were presented and a wide range of posters on production systems were displayed and discussed at the poster sessions. The Working Party scope included the technical, social, environmental and economic/ecological dimensions of production systems, whether to provide biomass or other products or services to society. Direct inputs to the IUFRO Working Groups and IEA Bioenergy Task Groups 30 (Short Rotation Crops for Bioenergy Systems) and 31 (Biomass Production for Energy from Sustainable Forestry). Assist in planning and organizing the 4th International Poplar Symposium, Nanjing, China, in June 2006. 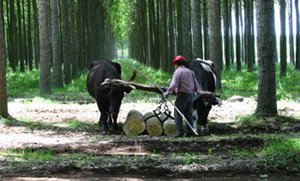 Recognize the role of Poplars and Willows in multi-disciplinary, inter-sectoral production systems. This group, set up at the sixteenth session in 1980, aims to promote coordination among specialists concerned with biomass production from poplars and willows. As this was a totally novel kind of cultivation, so far as techniques of cultivation, choice of cultivars and harvesting techniques were concerned, it was decided to assign these problems to a new group rather than splitting the study among the existing working parties. The specialized new group has thus been in a better position to maintain relations with institutions pursuing similar objectives, such as the International Energy Agency (IEA) and research units of the International Union of Forestry Research Organizations (IUFRO). 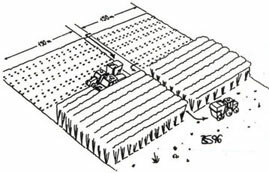 Correct biomass harvesting practices (Image: Raffaele Spinelli, FAO WP IPC/8)The scope of the working party was discussed in 1992 and most recently in 2000. There was general consensus that the scope should continue to stress that production systems not only produce biomass, but also provide a large number of environmental services. The scope should continue to encompass social, technical, economic and ecological aspects of production systems, whether designed to provide biomass or other products and services to society. In this connection it was noted that several papers were discussed by this group on phytoremediation in the meeting of 2000, and it was even proposed that this developing field merited a new working party devoted to it. Correct biomass harvesting practices (Image: Raffaele Spinelli, FAO WP IPC/8)The first formal meeting of the new group was held on the occasion of the XVII IUFRO World Congress in Japan in September 1981. Since then, biomass production in dense, short-rotation plantations of poplars and willows (including agroforestry systems with complete utilization of the combined biomass), regenerated by coppicing, has been introduced on an experimental scale in Belgium, Canada, France, Sweden and USA. Small-scale trials have been conducted in Austria, China, Hungary, Ireland, Italy, New Zealand, Pakistan, Turkey and the United Kingdom. It was recommended in 1996 that a report be prepared on the modelling of production systems in the Salicaceae. The importance of poplars and willows to social forestry, which should be regarded as multipurpose species, was recognized and member countries were encouraged to investigate the opportunities for technical assistance to support such programmes. It was further recommended that activities of the working party should include studies of the specific requirements for the growth of poplars and willows in the more northerly regions, including Scandinavia and the northern parts of China and North America. to stimulate interaction between experts in all aspects of willow and poplar cultivation.